Arsenal legend Thierry Henry is tipped to make an appearance as Atlético de Kolkata’s marquee signing for the 2015 Indian Super League season. Should Henry join the club, he will follow in the footsteps of Spanish international and UEFA Champions League winner Luis García, who helped the club to the 2014 ISL title. 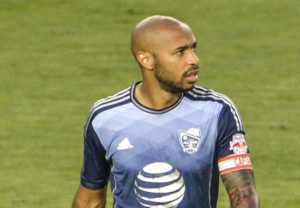 A World Cup winner in 1998, Henry also collected European Football Championship and Confederations Cup champion titles during his career. Henry’s eight-year term at Arsenal saw him accumulate over 200 goals in all competitions, as the club’s all-time record goalscorer. His later move to Barcelona saw him take part in the historic 2009 treble winning squad, taking La Liga, Copa del Rey and the UEFA Champions League titles. Henry’s signing for Atlético de Kolkata would represent another massive win for the club, with star-power rivalling that of Delhi Dynamos 2014 signing of Alessandro Del Piero. The club will be looking to replicate their success in the 2014 season, having won the inaugural title, despite a third place finish in the overall standings. Rumours of Henry joining the club sign off another huge week in the upcoming Indian Super League season, with Portuguese international Simão Sabrosa and former Fulham star Diomansy Kamara joining NorthEast United, and Brazilian Roberto Carlos joining Delhi Dynamos as manager.